Now that I have a feature-complete application from my perspective, I am ready to add plugin support so that other developers can extend the functionality of my application. I don’t want to make my application open source, so I want to just expose enough information about my application to them that they are able to create plugins. In order to give my application access to MEF, I need to add a reference to the appropriate namespace within my windows forms application. The namespace I need to reference is System.ComponentModel.Composition. Once I’ve done that, I need to add a new project to my solution of type “Class Library.” This project will be my “Plugin API” and will compile to a .dll file that I can distribute to developers as a part of my SDK so that they can create plugins that adhere to my standard. 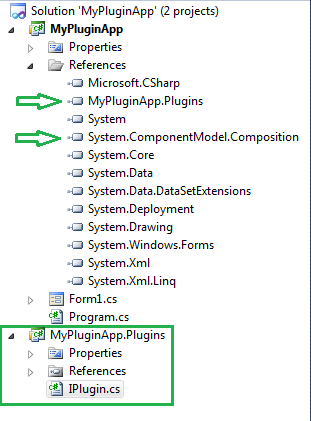 After creating my new project, I need add a reference to that project from within my Windows Forms project. // plugin developers to include as well. Next I need to update my UI so that it is able to display the list of available plugins and allow the user enable/disable them at will. I’ve opted to use a checked list box to achieve that goal. The plugins will load initially disabled, and the user simply needs to check the box next to the plugin in order to enable it, similarly unchecking the box will cause the plugin to be disabled. And now the code for the form, including the code to enable plugin support. New lines of code are highlighted for your convenience. //If our new event has any subscribers, invoke the event. //Best practice per MS is to dispose the CompositionContainer as soon as we are finished with it. This concludes post #2. In Post #3 I will create a few example plugins in their own solution without access to any of the code contained in Form1.cs, just as I would expect a 3rd party developer to be able to do. This entry was posted in .NET, C# and tagged C#, csharp, Managed Extensibility Framework, MangedExtensibilityFramework, MEF, Plugin on August 5, 2014 by Alan.